Cryptonight is a Proof-of-Work algorithm which is used by a number of privacy coins such as Monero, Electroneum and Bytecoin and can mined using computer CPUs and GPUs. In this article, we will examine most of the Cryptonight mining software, so readers will have a better understanding of each of the software, and can make a more educated decision on which one they want to use. This article is not trying to figure out which software is “the best”, since that needs to be determined by each individual miner, based on the features they want in a mining software. This article is more of a case study, overview of most of the Cryptonight mining software, as well as a how to, to be able to test them out for yourself. Any opinions or speed benchmarks presented in this article are just opinions, and rough estimations. They are not facts. Most likely, everyone’s mining setup will give different speed benchmarks, even if you have the same hardware and software setup that I am using. I will be mining Electroneum during this test and using https://electroneum.hashvault.pro as my mining pool. Currently I am using XMR-Stak, because I felt this mining software had the features I was looking for. I was curious though to see how well it performed against other mining software, and I wanted to also do more research on the features of the other mining software. Personally, my main priority was to find the fastest mining software. I also wanted the ability to remotely monitor if the miner was still running, and what speed it was running at. 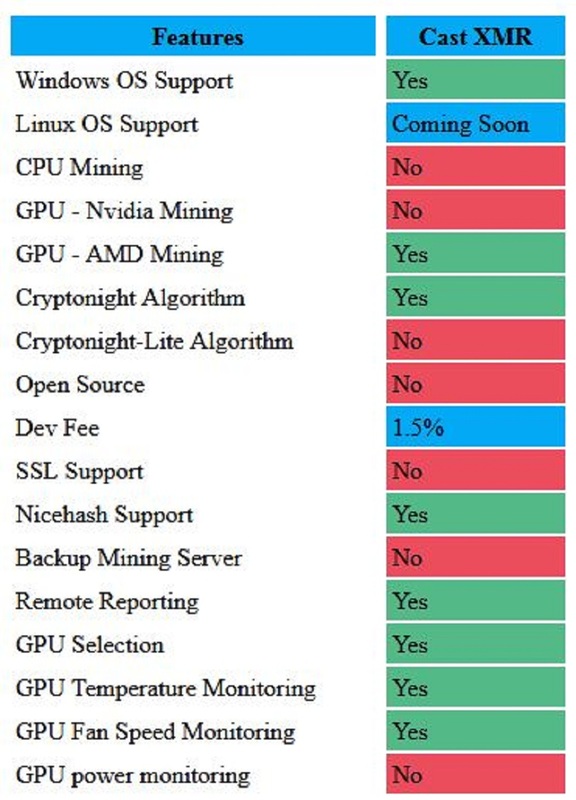 I do like the idea of open source software, but I mainly wanted the fastest miner. I also did not really care about the GPU monitoring features. I also made sure to use the latest versions of each of the mining software. XMR-Stak is probably the mining software that has the most features, and can run on the most platforms. The only thing that XMR-Stak seems to lack, is the GPU monitoring capabilities. To begin the test I ran the miner for one hour, and then I took the 15 minute average speed that it reports, as the speed benchmark. XMR-Stak reported the speed to be 5952.6 H/s. XMR-Stak gave no stale or invalid shares during the testing. It seems like XMRig AMD has a lot of features as well, but also lacks the GPU monitoring features. One thing to note is this mining software does not support SSL either. –opencl-devices=0,0,1,1,2,2 is to use GPU 0,1 and 2. I have double numbers because I want to use 2 threads per GPU. 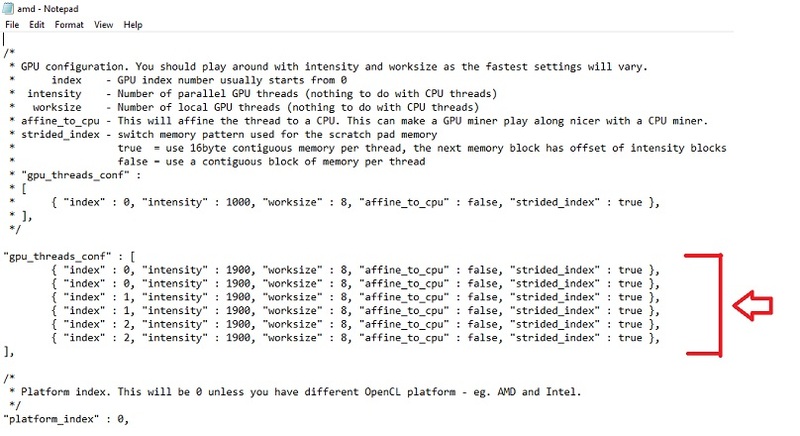 –opencl-launch=1900×8,1900×8,1900×8,1900×8,1900×8,1900×8 is to tell the GPU threads what intensity and worksize they should use. XMRig AMD reported the speed to be 5907.2 H/s. XMRig AMD gave no stale or invalid shares during the testing. The results were slightly lower than XMR-Stak. I also do not like the fact that you have to download separate programs to use the CPU, Nvidia, or AMD components. I personally do not use SSL, but I would like the option to use it. 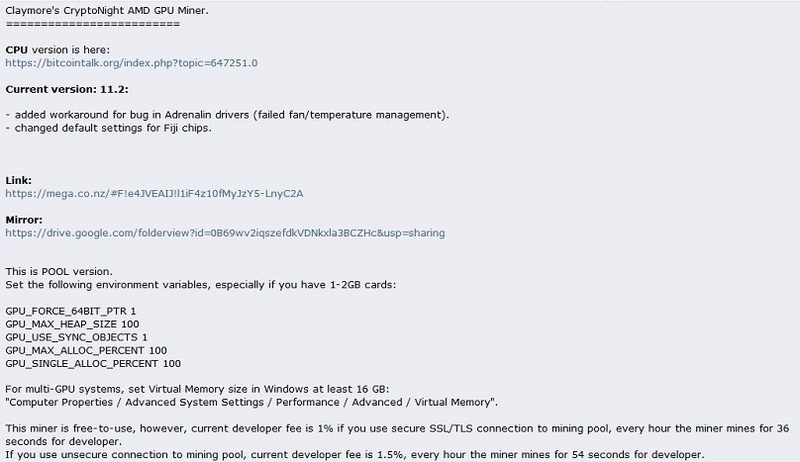 For these reasons, as of now I will still be using XMR-Stak as my mining software. Claymore’s Cryptonote AMD GPU Miner is not open source, but it does have GPU monitoring features. My plan was to run the miner for one hour, but I only ran it for 18 minutes, because it was clearly not as fast as the other two mining software. Claymore’s Cryptonote AMD GPU Miner reported the speed to be 5349 H/s. 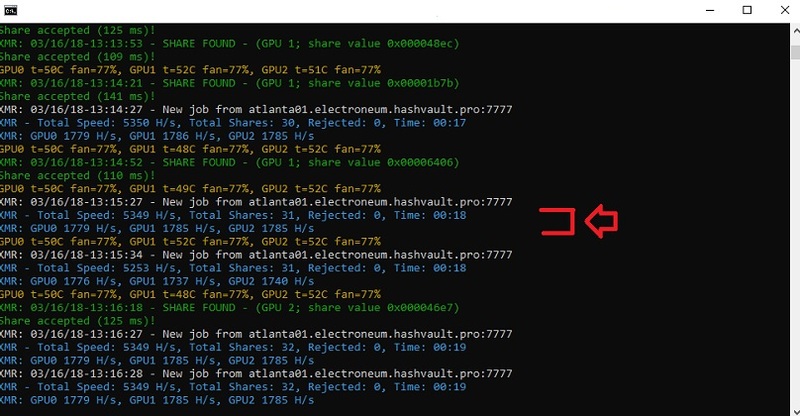 Claymore’s Cryptonote AMD GPU Miner gave no stale or invalid shares during the testing. The results were a lot lower than XMR-Stak. I also prefer open source software. For these reasons, as of now I will still be using XMR-Stak as my mining software. It seems like Cast XMR is the mining software with the least amount of features. I had to take the average of a section, because I was using the –fastjobswitch option. This option is suppose to switch quickly after a share has been submitted, but it will lower the average reported speed, since it will show 0 H/s for a few milliseconds. The average came out to be 2018.4+2023.3+2021.1 = 6062.8 H/s. This is faster than XMR-Stak. Since the speed was the most important feature to me, I had to do another comparison of XMR-Stak and Cast XMR. These speeds are within a margin of error, so more testing was needed. For the next round of testing I was going to test them using the statistics on the mining pool. I am testing for “Total hashes” as well as “Valid shares” and “Invalid shares”. I am going to run Cast XMR and XMR-Stak for 4 hours this time. I figure this is a long enough time to get a good reading, but not too long for a pool to lose connection or something that could make the test invalid. So once again, we have that they are in the margin of error. 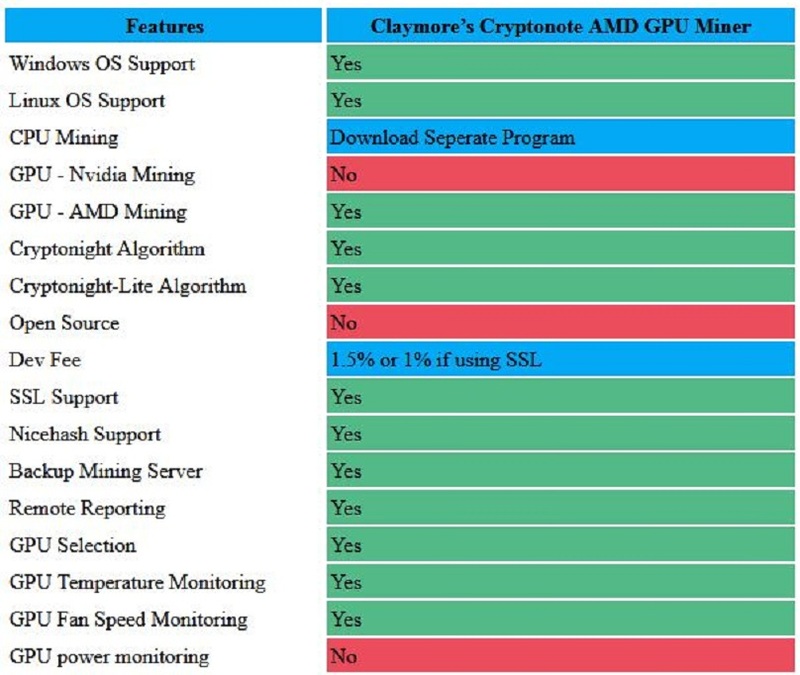 Here is the full features chart, so that you can easily compare which mining software may be right for you. For me personally, I have decided to stay with XMR-Stak. The reason for this was that the most important feature to me was speed. The differences between XMR-Stak and Cast XMR in my machine and setup, were roughly the same. I also prefer the Remote Reporting layout (HTML page) in XMR-Stak compared to the layout (JSON) in Cast XMR. 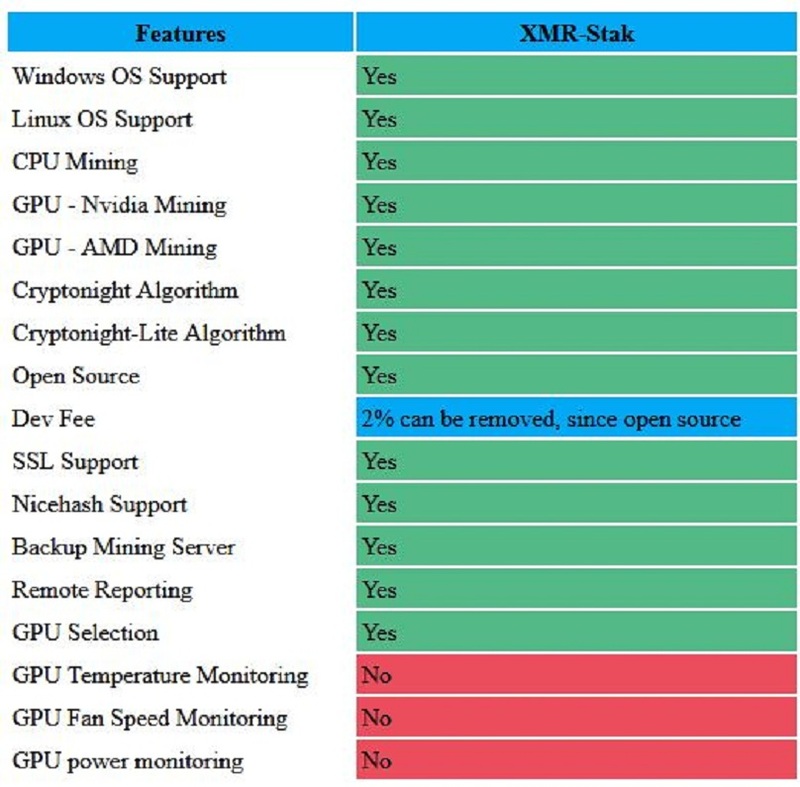 I also like that XMR-Stak is the most compatible with operating systems and components, compared to the other mining software. I do like the fact that it is open source and allows you to decide if and when you want to donate. Personally I would rather make a donation after a certain amount of months, rather than have my miner disconnect and reconnect every X amount of minutes, from the mining pool I choose to use. I also like that it is open source, because the community can learn and contribute better this way. I hope this article helps you decide which Cryptonight mining software is right for you, based on the features that are important to you. Hi, As a beginner to the crypto world. Can you suggest a good computer to mine the XMR-Stak. I read you used a setup like this 3 Vega64 GPU’s. Is the VEGA64 available on line? And if so, how did you connect them together? You really have to do a lot of research before you buy and figure out what you want to mine long term. I wanted to mine the Cryptonight family of coins so this is why I bought the VEGA’s since they are the fastest GPU for Cryptonight at the moment. I know NVIDA is releasing new cards in the summer so I dont know if they will be faster for CN or not. I used some of the recommended parts from them. I also used the tutorial to setup the computer once I purchased it. It wont tell you how to build a computer (another tutorial would work for that) but once you get the machine to power on and install windows, then the the vega mining guide should help you setup the vega machine. But I miss one miner from your list. Simple Miner (http://cryptomanager.net) is an effective miner software. Why isn’t it in the list? Thanks for letting me know about this mining software. I know there has been a few released since this article. Eventually maybe around the end of the year I would like to write a “part 2” series and add some of the other mining software in, as well as retest the original software, since those are being updated all of the time. 1. However, since XMR-Stak is open source, one could lower or remove the fee completely…. Good article, I went through this pain of testing these programs and wish this was here then! Have ended up using Cast over Stak for simplicity! Interesting article, how safe is Cryptonight? Is it profitable to mine even if you do not have a high-end PC? Recently I’ve been mining in Webchain’s pool because it’s ASIC-resistant (being ASIC-resistant translates to difficulty of mining being higher) but I’d like to know if there are any other safe but also easy ways to mine?